Here’s the real deal, you love to travel, but you hate that it sometimes means leaving your favorite hygiene products behind, and most often, that includes your coveted and much-loved hairdryer. As wonderful as hairdryers are, it’s unfortunately a common fact that they’re not conducive to travel whatsoever. Usually, they’re awkward, bulky, and overall, just hard to pack. But that doesn’t mean you have to go without a hairdryer on your next trip, you just need a travel hairdryer. Check out our list of must-have travel hairdryers below for your next trip. Conair is a total classic. This 2- heat, 2-speed hairdryer is functional, convenient, and most importantly, versatile. It’s a dual voltage system for stress-free voltage worries, features a folding handle to make it more compact when traveling, and has a removable air filter to help save even more space (and make your packing situation a lot less complicated). A revolutionary tool from Andis, this 1875 Watt Fold-N-Go Ionic Hairy dryer is a 3 heat and 3 airspeed dryer that’s the ultimate tool for styling and control on the go. With ion technology to reduce the frizzies, this Andis ceramic cuts your drying time down, leaving you more time to adventure an explore during your travels. The best part? It’s tiny! Not only does it measure in at 4 inches by 8 inches by 6 inches, but it’s also only about 1.65 pounds. It has a retractable cord and a folding handle for even more convenience. Another Conair product, the 1875 Watt Compact Folding Handle Hair Dryer is a small but powerful little tool you’ll want to include on your next trip. With dual voltage for worldwide use, it doesn’t matter where you’re traveling. Though it only has 2 speeds and 2 heat settings, this hair dryer has a full 1875 watts of drying power and a cool shot button to cut your drying time down. But most importantly, it’s travel-friendly. With a folding handle and compact build, this little guy will pack a serious punch in your hair drying routine, but never in your packing routine. Finally, a Revlon product makes its way to our list. This compact dryer was crafted with a folding handle design and a shorter drying tunnel to make packing and traveling with this dryer a total breeze. It features a 2 heat and 2-speed setting, a cool shot button, and even includes a smoothing concentrate attachment with purchase. The best part? It features worldwide dual voltage so you can bring this little guy with you everywhere. Another BaBylissPro on the list to save the day! This tiny dryer packs a powerful punch of 1000watts to help boost your drying time while you’re out and about traveling. Further, it’s got a dual voltage system that allows you to use this little dryer anywhere. The most unbelievable part about this dryer? It’s size. It’s only about 55 inches x 2.5 inches and only weighs 14.4 ounces. Talk about light and compact! Yet another dual battery hairdryer, the JINRI 1875 W Travel Hair dryer is a convenient choice when you’re planning to travel internationally. It features a helpful adapter to switch the voltage just by twisting the button at the base of the dryer. Further, it features a folding handle, making it ideal for packing in tight suitcases, is super lightweight, and features a hanging loop so it’s out of the way if you’re staying in an area with a small space. With 1875 watts, this motor is guaranteed to dry your hair fast and beautifully. Conair made our list again for a reason, they make awesome, compact hair dryers that are exceptionally useful for folks who love to travel. 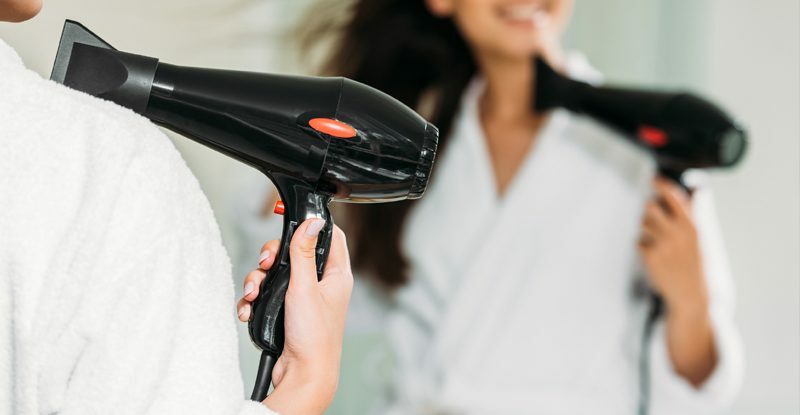 This 1600 watt hair dryer might not have the same power that some of the others on this list do, but with its folding handle, short barrel, and lightweight, it’s hard to deny that it’s a great travel choice. It features 2-heat and 2-speed settings to give you options for your drying process, and even has dual voltage, another great travel add-on.